When I was a teenager just beginning my musical journey as both musician and wannabe musicologist, I came across Walter Carlos (just prior to his Wendy conversion), and his/her series of ground-breaking, Switched-On Bach recordings. These adroitly and painstakingly Moog synthesized, electronic adaptions of Bach, Handel, Monteverdi, and Scarlatti (realized more in the abstract than as explicit instrumental recreations), captured both my imagination and generated a profound interest in the music of the baroque period. Carlos’ own sonic interpretations of the Brandenburg Concerti, Handle’s Water Music and selected Scarlatti keyboard works, produced a highly accessible portal which ultimately led me to the original scores and their recordings. Not so long ago, I heard a few tracks from the first Switched On Bach recording and was taken aback by how technically dated and musically monotone they seemed. Nonetheless, I still feel indebted to the recordings and their creator for opening the door to literally a century’s worth of wonderful music. And with this as the most incongruent of preambles, I hope Chaplin: The Musical!, which opened at the Ethel Barrymore Theater on September 10th, will inspire its audience to look-up some of Chaplin’s Mack Sennett one reelers (35 produced in 1914); or the best of his work at the Essanay Film Studio (15 in 1915); all of the Mutual Masterpieces (12 from 1916-17); the First National productions (including “A Dog’s Life”, “Shoulder Arms” and “The Kid”) - and the sublime and indispensable United Artists feature films (beginning with “The Gold Rush”, and followed by “The Circus”, “City Lights, “Modern Times”, “The Great Dictator”, Monsieur Verdoux – and ending with “Limelight”). For myself however (and, yes if it’s not clear by now, I am a Chaplin fan and aficionado), I don’t feel especially compelled to buy a ticket; much for the same reasons I wasn’t terribly enthused about seeing a two-act musical called “The Civil War”. I just think putting Chaplin on the stage for a musical biop risks being disappointing for the initiated - and absolutely maddening for the devotees. Firstly, and generally speaking, shows about silent film comedians always (and no pun intended) sell their subjects short. Directors and actors get the clichés, the broad strokes and superficial characteristics without understanding the driving impulse, timing and genius behind inspired physical comedy and sight gags. 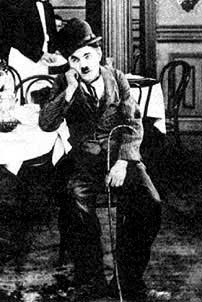 Personally, I hate outer directed Chaplin impersonations. I find they tend to be all derby and no Chaplin. Having not seen the Chaplin musical, I can’t speak for Doug McClure’s well-praised performance as the “Little Tramp”, but honestly: Lucille Ball, Robert Downey, Jr. – even Billy West, an early screen contemporary of Chaplin, who did an extremely convincing job of essentially ripping off Chaplin’s act - couldn’t come close. The costume can be correct, the body-type close enough – even the basic physicality can appear, seemingly spot-on. 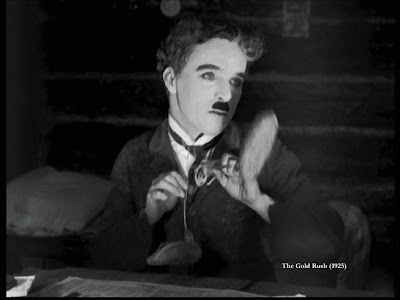 And yet, not one performer I’ve ever seen seems to understand the inventiveness and subtlety of Chaplin’s facial pantomime and economy of gesture; not to mention that under the make-up, moustache and pratfalls was a great comic actor. For that, switch-on a Chaplin two-reeler. A big shout out to you. You make a lot of interesting points here. While I agree with you on many levels, I think the point of creating any sort of theatrical presentation on such an historical figure as Chaplin is to keep the man's name alive and celebrate his immense talent. Having taught in the NJ Public Schools for a few years, I can tell you that young people in particular have absolutely no idea who this man is, and anything to draw them into his genius (i.e. the subject of a Broadway show) is cool to them. Several students who never heard any jazz except when I taught music suddenly came up to me when Princess and the Frog by Disney came out. Because they'd seen and heard some in this movie, they were interested. At this point, there are very few people under the age of 50 who know Chaplin, and even fewer who comprehend how he changed comedy, and motion pictures in general. While I suspect that the show may have been an excuse to have a central character that would keep the thing together, if one more person picks up a DVD of Modern Times, Gold Rush, or even his Sennett and Essanay comedies, that is a positive thing.